Please join our private beta program and let us know how you use these new features or if you need even more control! The parameter Fore/Background controls whether a track should be in foreground, in background, ducked, or unchanged, which is especially important for music or clip tracks. For more details, please see Automatic Ducking, Foreground and Background Tracks . We sometimes received complaints from users, which produced very complex music or clip tracks, that Auphonic changes the levels too hard. If you set the parameter Fore/Background to the new option Unchanged (Foreground), Level relations within this track won’t be changed at all. It will be added to the final mixdown so that foreground/solo parts of this track will be as loud as (foreground) speech from other tracks. It is now possible to set the level of background segments/tracks (compared to foreground segments) in background and ducking tracks. By default, background and ducking segments are 18dB softer than foreground segments. Similar to our Singletrack Advanced Leveler Parameters (see this previous blog post), we also released leveling parameters for Multitrack Productions now. Select the Speech or Music Leveler for this track. If set to Automatic (default), a classifier will decide if this is a music or speech track. The parameter Dynamic Range controls how much leveling is applied: Higher values result in more dynamic output audio files (less leveling). If you want to increase the dynamic range by 3dB (or LU), just increase the Dynamic Range parameter by 3dB. For more details, please see Multitrack Leveler Parameters. Select a preset for Micro-Dynamics Compression: Auto, Soft, Medium, Hard or Off. The Compressor adjusts short-term dynamics, whereas the Leveler adjusts mid-term level differences. Change the stereo panorama (balance for stereo input files) of the current track. Possible values: L100, L75, L50, L25, Center, R25, R50, R75 and R100. Video: Audio Lautheit und Dynamik. Maximum noise and hum reduction amount in dB, higher values remove more noise. In Auto mode, a classifier decides if and how much noise reduction is necessary (to avoid artifacts). Set to a custom (non-Auto) value if you prefer more noise reduction or want to bypass our classifier. Set the hum base frequency to 50Hz or 60Hz (if you know it), or use Auto to automatically detect the hum base frequency in each speech region. Maximum hum reduction amount in dB, higher values remove more noise. In Auto mode, a classifier decides how much hum reduction is necessary in each speech region. Set it to a custom value (> 0), if you prefer more hum reduction or want to bypass our classifier. Use Disable Dehum to disable hum reduction and use our noise reduction algorithms only. In the Master Algorithm Settings of your multitrack production, you can set the maximum allowed true peak level of the processed output file, which is controlled by the True Peak Limiter after our Loudness Normalization algorithms. 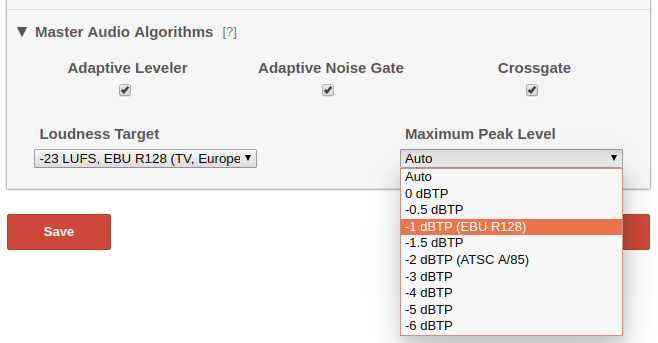 If set to Auto (which is the current default), a reasonable value according to the selected loudness target is used: -1dBTP for 23 LUFS (EBU R128) and higher, -2dBTP for -24 LUFS (ATSC A/85) and lower loudness targets. All advanced algorithm parameters, for Singletrack and Multitrack Productions, are available in our API as well, which allows you to integrate them into your scripts, external workflows and third-party applications. Please join our beta and let us know your case studies, if you need any other algorithm parameters or if you have any questions! We are happy to send further invitation codes to all interested users - please do not hesitate to contact us!